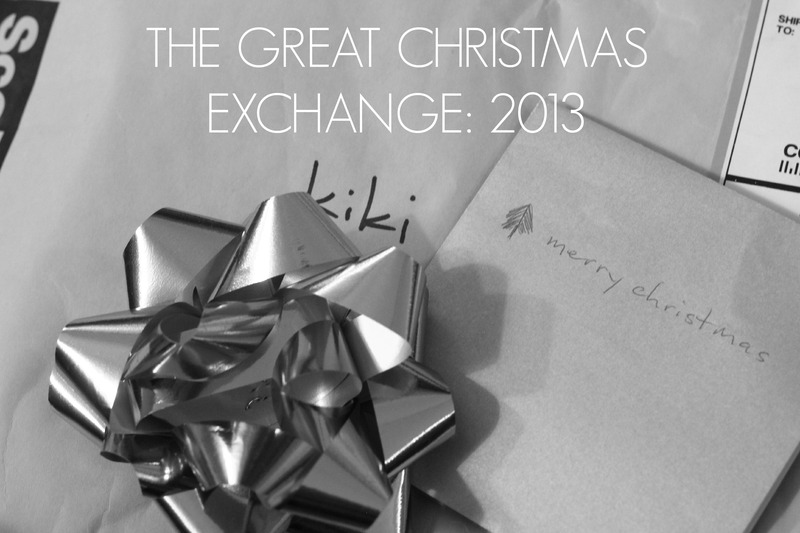 THE GREAT CHRISTMAS EXCHANGE 2013. I'm kind of really excited about today's post. Like really, really excited. 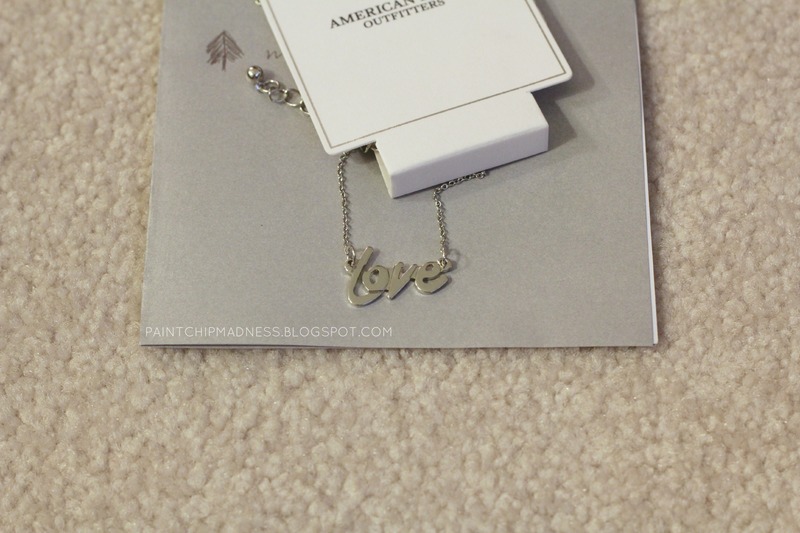 Today's post is all about Samantha and Beth's Great Christmas Exchange. I've honestly been excited about this post since the day I signed up (which was what, back in October?). Anyway, today's post is all about the connecting. A chance to connect with the other bloggers who participated, see who got who (or whom), and see what everyone got from their Secret Santa, too. So, in the spirit of Christmas-never-ends, here's a glimpse into what I got Timber (my exchange recipient) and what I got from my Secret Santa, Kjersti. This is going to sound terrible, but I actually forgot to take photos before I wrapped all of Timber's goodies. Complete blogger fail. But I'm crossing my fingers that Timber blogs about it on her blog and that all will soon be forgotten. No pressure, Timber, okay? While reading Timber's list of likes and loves, I realized just how much the two of us had in common. A love for scarves, journals, reading, mugs, and hot apple cider? Yeah, I'm thinking that this exchange was meant to be--it was almost like shopping for myself! As for what's actually hidden underneath the wrapping paper, I bought Timber a cozy chunky knit infinity scarf, a cute owl pendant, Skittles, and the cutest salt and pepper shakers ever. Timber loves owls (could you tell by what I got her?) and when I spotted these little guys, I knew I had to get them. Hopefully she liked them as much as I do! Now onto the fun part (for me at least): sharing the loot I got from my super sweet Secret Santa. Kjersti actually sent her package super early (such an organized lady!) and I got it back in November but forced myself to wait until Christmas. 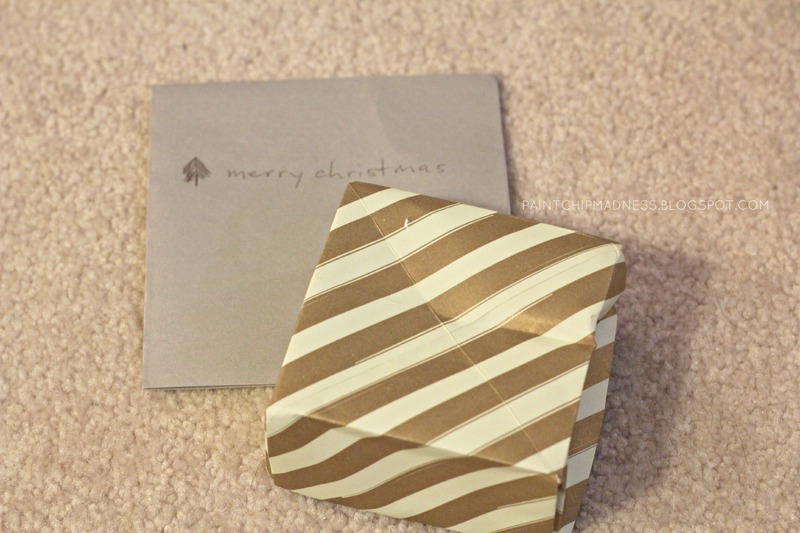 So it sweetly sat under the Christmas tree for a few weeks, longing to be opened. Once I opened it, I knew this lady had been snooping in my Pinterest because each gift fit me to a T.
A cozy grey(!) scarf, an adorable pendant, and sour gummy worms? Yep, this girl knows me all too well. 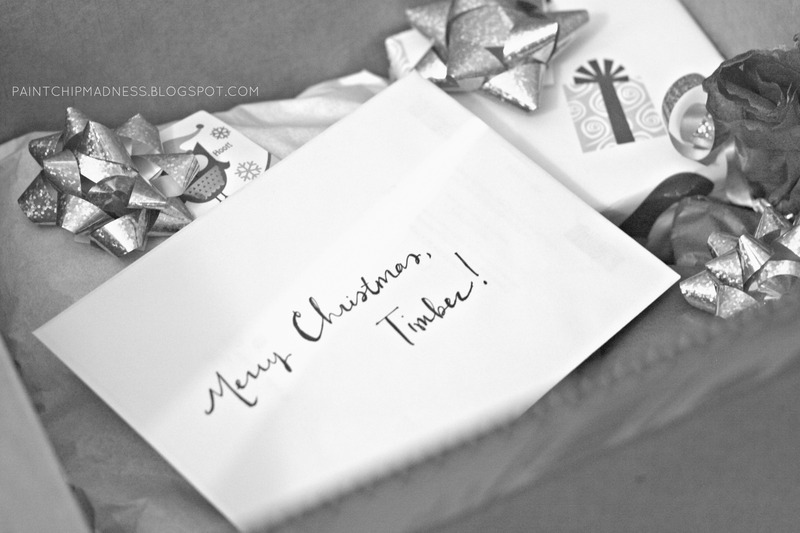 So a special thank you to Kjersti and if you're reading this Timber, I hope you enjoyed your package! And a huge thank you to Samantha and Beth. You two ladies rock for coming up with this idea and for organizing it all, too! All in all, I'd say The Great Christmas Exchange 2013 was a complete success and I'm now ready and super excited for this year's exchange. Got that, Samantha and Beth? p.s. Want to see what other people shopped/shipped/received? 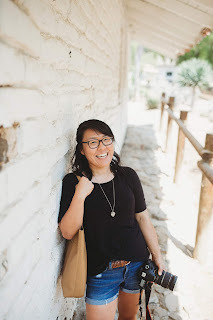 Check out Samantha and/or Beth's blogs today! 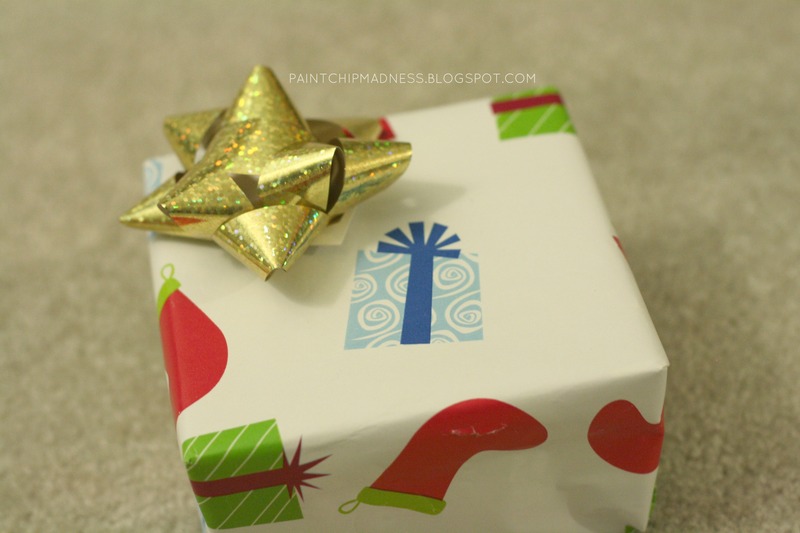 i love reading about all of these gifts! :) the owl S&P shakers are so cute!!! love the goodies you got, too! that scarf looks cozy & you can never go wrong with gummy worms! I haven't had a chance to read them all yet but I'm super excited to! I think it's the snoop (otherwise known as blogger) in me. :) And I, too, looove those salt and pepper shakers. I so wish I had gotten a second set for me. :) And the scarf is definitely cozy--I wore it all day and loved it. p.s. 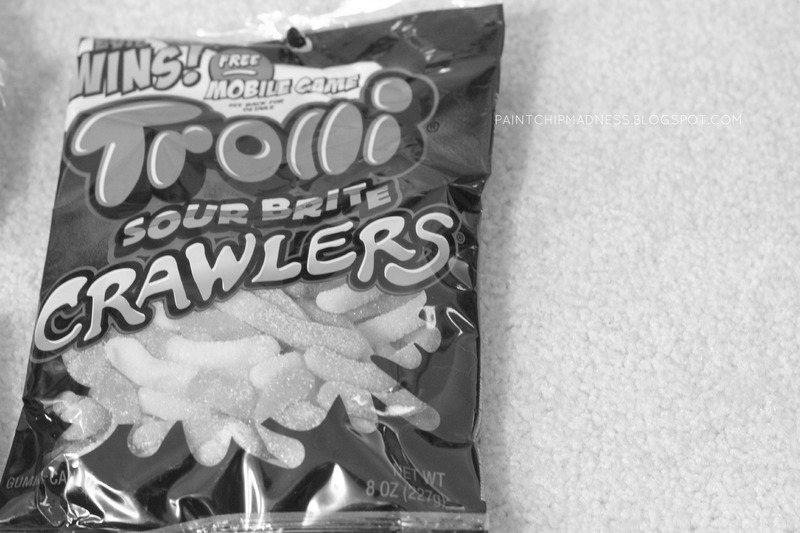 You definitely cannot go wrong with gummy worms! 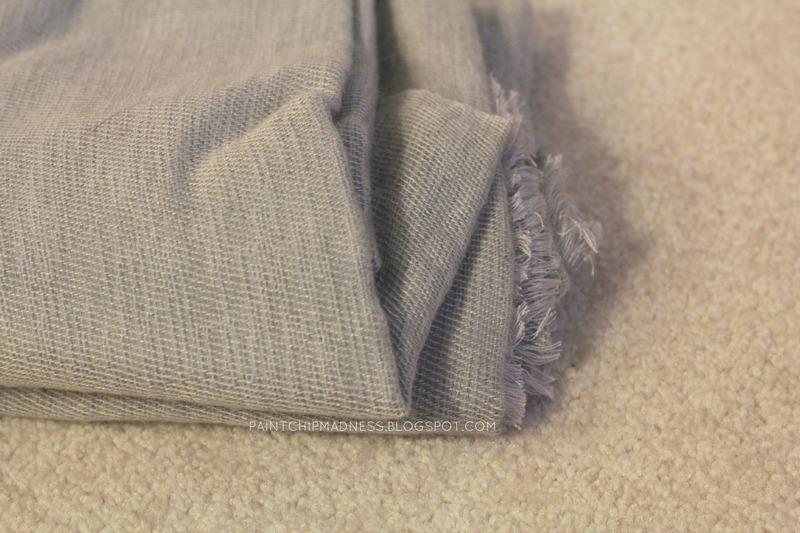 That scarf is beautiful, and so versatile! 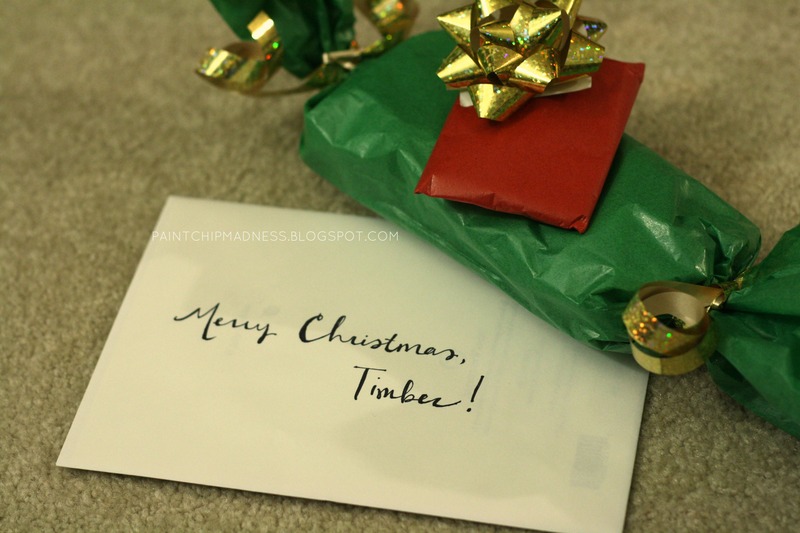 You handwriting on the card to Timber is perfection...do you do calligraphy? I'm in the process of learning it now! It really is! I love versatility when it comes to clothing so Kjersti definitely did a good job shopping for me! And no, sadly I do not do calligraphy! I've always wanted to and I have an old pen and black ink from an art class I took in college, but sadly, never got to do any calligraphy with it. I'd love to learn, though! Are you taking a class or doing something online? I'd love to see your work! This was so fun! I agree about your handwriting! So very pretty! Oh, and thanks! That is so sweet. I'm constantly trying to make my handwriting cooler, but I think it's camera shy or something because my handwriting seems to look good when I try the least! LOVE that scarf and that necklace!!! and that candy would be gone in a day if I received it!! lol. I am soooooo glad you participated and you better believe it is coming back next year! this girl LOVES traditions! And I'm already excited for next year! I had no idea how much fun it would be and how much I would love, love, love it. Thanks again for organizing it! love the scarf girl! so cute! And your handwriting on the envelope is really pretty! Same! So glad you like it! Excited to read your post! And I really hope she blogs about it! I'd love to see her reaction to it all! Did you participate? If so, I want to know what you got/gave! i love that she did proper "snooping" to know how much you would like your gifts. a true blogger detective! fun gifts! Now I'm excited to see everyone else's posts (including yours if you participated!). Cute!! Everyone did such a great job of getting to know their partners! 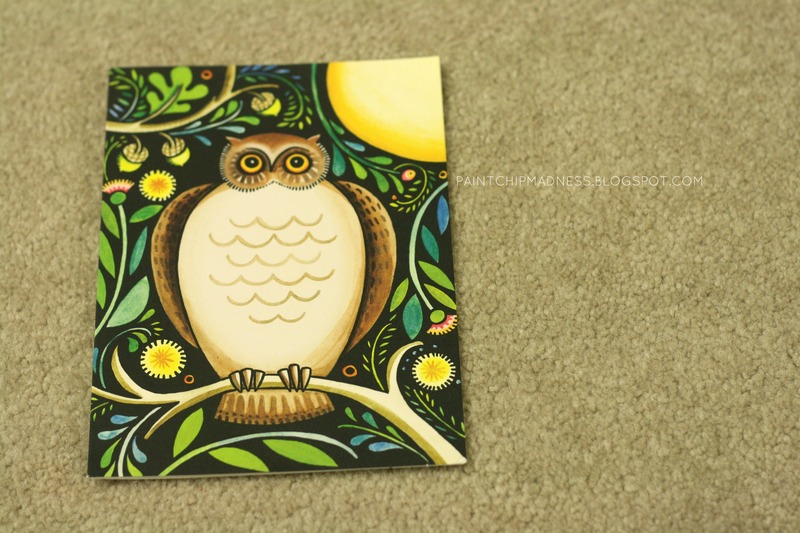 Honestly, I think blogging is the best way to do this kind of swap! I feel like with workplaces in such, we might know the person, but we might not really get to know them or something like that. With blogging, we get a chance to snoop and check out their blogs and other social media accounts while maintaining our Secret Santa status. So excited for this year's swap and to read your post, too!! Hello friend! I'm so glad you participated! So many fun goodies! Hello to you, too! :) I'm so glad I participated as well! I was a little unsure about it at first, but in the end, it was definitely worth it. I loved seeing everyone's goodies and seeing people make new friends, too. Thanks again for coordinating this!